While I am in the midst of covering some of the European Moth design history, mention must also be made of the entry of a Moth type, designed by Mothists Dunand and Fragniére, in the IYRU singlehander trials of the late 1960's. 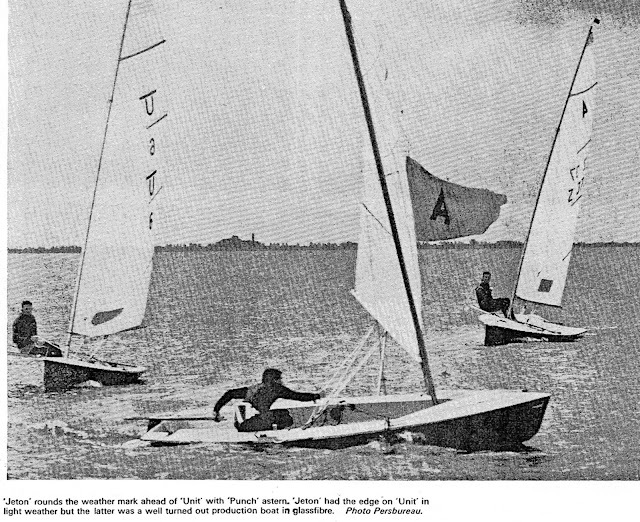 (Three sets of trials, three different locations, Weymouth, England 1965; La Baule, France 1967; and Medemblik, Holland 1968, with the eventual winner being the Contender.) She was called Punch and it appears that she was initially designed by B. Dunand and then the project was taken over by Fragniére for the last set of trials. 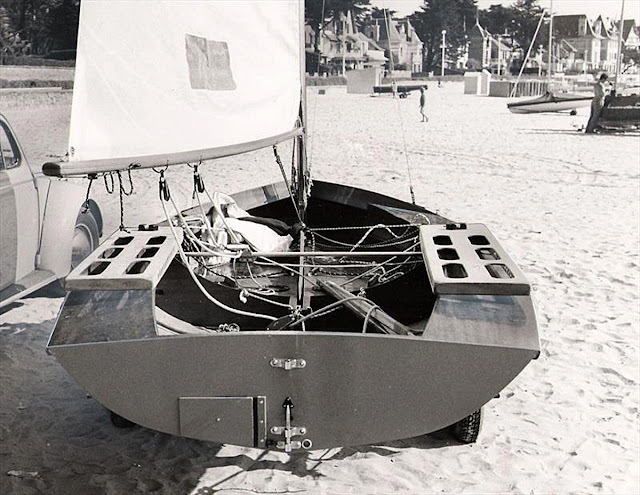 Punch showed up at the second trials in La Baule and, with her low wetted surface, was the fastest over twenty three entrants in a light air regatta. 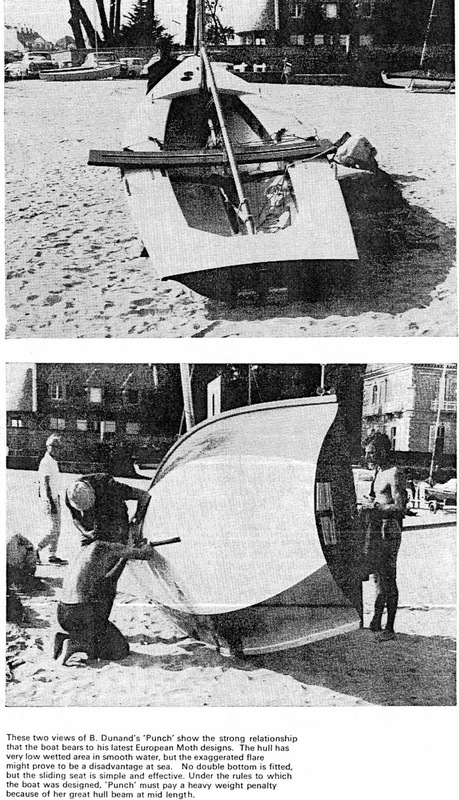 Hubert Raudaschl, a Finn sailor, designed Jeton, which, in the last set of IYRU trials of 1968, took over the round hull-shape, low-wetted design mantle from Punch and finished second to the Contender. Below is a photo of Jeton at La Baule. She sported these weird set of folding seats that stored flush to the aft deck and individually swung out when needed. It was a feature that definitely would have needed to be changed out if she had been selected. In 1970, the Jeton hull was flattened out and re-purposed as a two man, main, jib, spinnaker dinghy. I'm always fascinated at the stories of the Single-handed trials from the 60's, some interesting designs appeared, most of which never made the grade. It would be good to see a head-to-head of current singlehanders in preparation for th Finn replacement at the Olympics. BTW your current Header - is that a Gwen 12? You probably know that Iain Oughtred was a Gwen Nat champion back in the day....! Yes that is a Gwen 12. Got some photos from the ICWDR in Australia and will put a post up at some point. Some Aussies are getting this vintage dinghy design out on the water. Ian and the Gwen 12 are featured in the following post. Music Whenever: Lord Huron "The Night We Met"